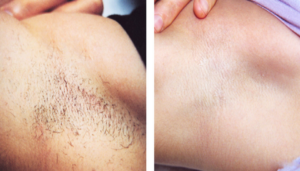 Laser Hair Removal is a safe and non-invasive method to reduce hair growth in the treated areas. Ageless Laser Med Spa uses the latest equipment and all our services are performed by our highly experienced and trained physician, Dr. Gligoric. Our Cynosure Icon laser is state of the art and medical-grade. Summers in San Antonio are long and hot, so you can wear shorts, sleeveless tops and Bikinis almost year round. Are you tired of shaving, waxing and plucking your hair every couple of days to achieve smooth and hairless skin? Ageless Laser Med Spa in San Antonio is your solution. The laser sends pulses of highly concentrated light directly into the hair follicles, where it is absorbed by the hair’s pigments. This kills the hair and prevents future regrowth. The treatment directly affects the root of the hair and only works during the active growing phase of the follicle. To maximize your hair loss results, you should avoid waxing or plucking, as this temporarily removes the hair root and therefore makes the Laser Hair Removal treatment less effective. Most patients see a significant reduction in hair regrowth after three to seven sessions. In my opinion, Ageless Laser Med Spa is the best med spa in San Antonio. Nobody gives the kind of personal caring and attention to detail like Dr G.
Dr. Gligoric is fantastic at facial fillers (I've had botox and juvederm). I feel safer having a real doctor do my fillers, rather than an esthetician at other spas. Dr Gligoric makes everything look perfectly natural. "Dr. Gligoric was genuinely invested in the quality of my results. I feel lucky to have had a physician closely monitoring my treatments and I have been very happy with the outcome of the laser treatments I received. ....the best thing of all was about 3 months after the treatment, when new collagen started to grow as a result of the treatment, filling out my face in all the areas where I had lost my baby fat after turning 30. Now, I seriously look several years younger again. Very happy with this experience! Dr. Gligoric was genuinely invested in the quality of my results. I feel lucky to have had a physician closely monitoring my treatments and I have been very happy with the outcome of the laser treatments I received. My experience working with Dr. Gligoric has been truly amazing. She genuinely cares about the patients well being. If you are looking for an honest and kind person to target all your skin care needs then look no further! 2019 © Ageless Laser Med Spa. all examples shown are for informational purposes. Individual results may vary.